Part of my race review process is to look at Strava data. This process is relatively simple. You can look at a runner that participated in a race and view other results from the flyby feature. Sometimes I find course cutters. They are obvious because their tracks do not follow the rest of the participants, and their mileage is less. Most of the questionable runners I find on Strava are not official participants. They are bandits. Sometimes they jump on the course to do a few miles as a training run, or to pace a friend. In many cases they jump in right after the start simply because they don’t want to pay the entry fee, or they decided to run after registration closed. 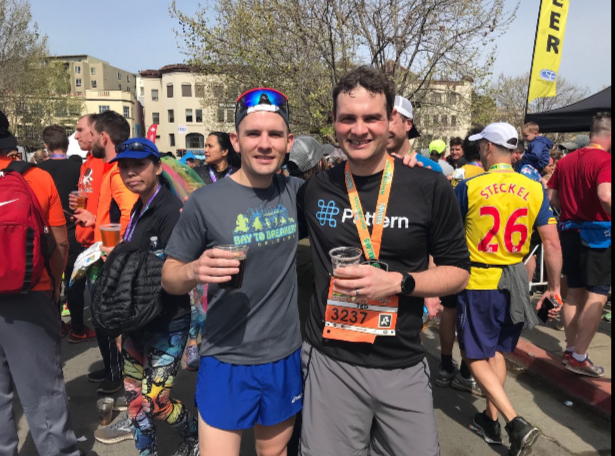 A runner looking at their Strava data from The Oakland Half Marathon noticed a couple such runners. Taylor jumped into The Oakland Half Marathon this past Sunday. He openly admitted it. Taylor’s run is on Strava. Taylor clearly was aware that jumping on the course was wrong. It is unclear if he took a medal. It looks like he accepted a post race beverage. It is clear that he did not pay to run on the course. 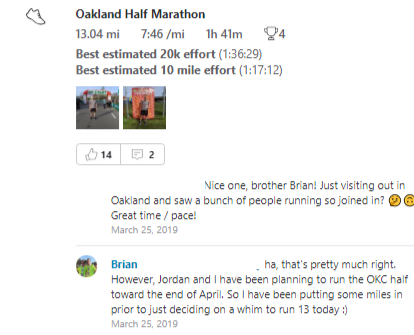 Brian also ran the Oakland Half Marathon. He was also found on Strava. He took the medal, and, as is the case with all other bandits, he benefited from support on the course. 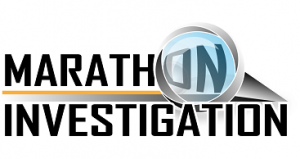 I will likely write more regarding The Los Angeles Marathon. I looked on Strava and I found a half dozen runners that were unregistered that ran varying portions of the course. They admitted this through their Strava entries. In other cases, it’s simple enough to check the results to see which runners were unregistered. I will have more on Los Angeles in the upcoming days. I have received numerous reports of bib swapping and am running down some cases of suspected course cutting. Next articleBib Stealing and Course Cutting at The Barkley Marathons? Writing from Europe here. You are probably aware of this argument, but let me restate it for some perspective. Here is an analogy: Suppose you live in a residential area, it’s your 40th birthday and you have invited your friends from college. Of course, there’s going to be some noise. What do you do? You tell your neighbours about the party, offer them to join if they want to and kindly ask them to speak to you and not the police in case it’s getting too loud. Legally you are still not allowed to throw this kind of party and neither are the neighbours legally entitled to free beer all night. I can’t put down the social convention in play here precisely, but it seems clear that there is a social expectation to not apply the law too literally. What does this have to do with banditing? There’s a more or less explicit social norm that races on public roads contribute something to the local community. Technically, if you have the permit, you can organise your race whatever way you want. If you don’t corporate with running clubs or demand 80€ from local university students to run a half, you have the law on your side. But you shouldn’t be surprised if next year all mile markers are miraculously at the wrong spot and angry letters are sent to the newspaper and local authorities (participants not using porta potties, elderly people being treated badly when crossing the course, a story about the talented kid from a poor neighbourhood who can’t afford the race and so on). So after two years local authorities rescind the permit because your race is no longer conceived as contributing something to the common good (which may even be a legal prerequisite for events in public space) and your race is dead. Good luck with finding a private golf course who wants to have your race at their premises! So what do you do? You turn a blind eye on bandits, work with local clubs and create a happy-go-lucky, feel-good atmosphere for your race. Of course, some bandits may not be local, young or poor, but dull libertarian freeriders. Yet sorting these things out is an administrative nightmare. So as long as enough money comes in from middle-aged well-off hobbyjoggers who are in need of an official chip time, don’t want to start dead last and need a medal for boasting, everybody is happy. So that’s the response to those who accuse bandits of stealing: If you insist on disallowing bandits, we insist on all races offering free bibs to young and poor runners. By analogy, if you throw a little over the top party, I come around and chat with you for some minutes while drinking a free beer (but I don’t expect ten beers or champagne!). Congratulations. You just proposed the most moronic argument I’ve ever heard. You should be proud as there are many contenders for this title. Quick point. Some races aren’t run on closed courses. So it is possible that runners might seem to be jumping into an event when in fact they are just doing their normal running route. BO you are obviously making this up. Who would accidentally jump into a race, take some drinks, then take a medal. These are people who dont want to sign up and pay the entry fee. They’d rather just fake run and pretend to be heroes. If someone is 16 years old this makes sense. Anyone older is an idiot. Now if only Derrick would print their full names and social media profiles. As a race director I find it a tricky one, someone one got in touch and asked about taking part in my club’s 20 mile marathon preparation race – he wanted to know whether the entry fee went to charity. I explained that no, as is common with all running clubs we hold races to fund the club activities, club admin, subsidise the kit etc so that we can have a reasonable annual membership fee and actually £20 was a reasonable entry fee for the usual support + on course gels + sports drink + finisher tech shirt. His reaction was that as he runs on the route we use regularly he saw no point in paying and he would do the same whilst our race was in progress. Although he was deliberately being a pain I don’t see how we could reasonably object. Back then we were doing hand timing and if someone went through the finish with no number we quizzed them, usually to be told “my number fell off”. One of the advantages of chip timing is that this ploy doesn’t mess up our results. Why anyone handed out a medal to a person without an official number on their chest? Most medal volunteers are kids, family of organizers, etc, handing medals out to dozens per minute crossing the line so they can clear out for the next people. Don’t think anyone has the time or energy to “police” the process. Some runners take off their bib attached shirts, etc, so really not worth trying to stop 10 bandits out of 1000 participants or whatever the numbers are, just my imo, but more trouble to try and stop it, than to ignore it. 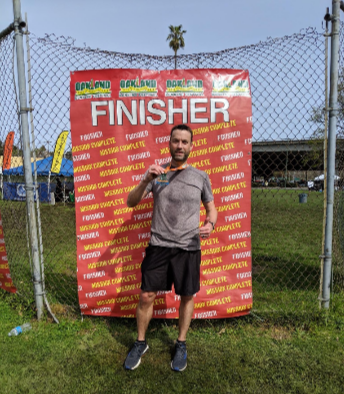 I ran the LA Marathon Sunday. I did notice people between miles 15ish-23ish looking extremely fresh and jogging along – through the neighborhood sections. As stated some people seemed to be “guiding” a friend or relative a good chunk of the way. I’m sure some people do just want to meet up with their friend or relative in the race and jog a mile with them or so and hop off. But to run the last half of a marathon and celebrate at the finish line – thats lame. The Oakland Marathon bib had two beer tags, both of them are missing from Ted’s bib. I assume that Ted shared his second tag with Taylor. We don’t know whether he used any water stations. Yes, still a bandit if he ran the official course, and not on the sidewalks obeying to all traffic rules.